One of the Sundays when Mary and Jeanie were still in town, we went to Sprout for brunch. If you are top chef fans, the names Dale Levitski and Sarah Nguyen may ring a bell. They joined forces after the show ended and opened Sprout in the fall of 2009. 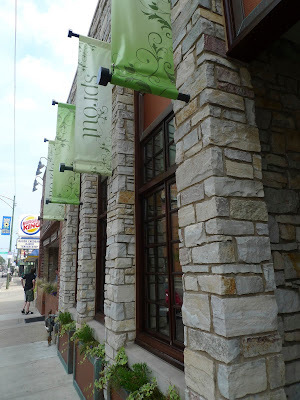 Sprout has a three course prix-fixe dinner menu, which looks really interesting, but sad to say, it never made it to the top of my list when picking a place to eat amongst friends since not everyone wants to do a prix-fixe. 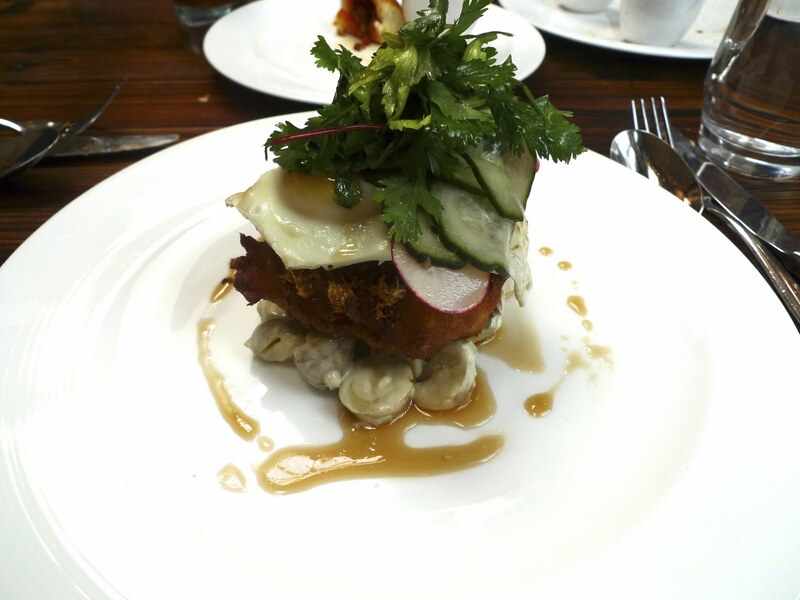 But when they started serving brunch on Sundays earlier this year I knew that would be more conducive to me visiting. 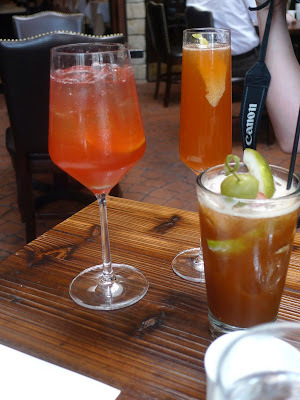 They started serving brunch in the spring of 2011 and I had heard that it was wildly popular and that you had to make reservations in advance. I was a little surprised however, when we arrived on a Sunday afternoon, to find the place mostly empty. I think there was maybe three other parties eating brunch during the whole time we were there. We started off with an order of drinks. Here is their take on the Bloody Mary, made with vodka, pickle, house made bloody mix and thai chili. 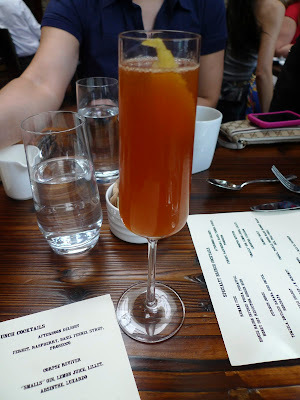 Mary ordered the BugeyMosa, their take on mimosa's with Bugey Cordon instead of champagne, fresh squeezed OJ and ras el hanout. Ras el hanout, in case you are curious, is a mix of Moroccan spices. The drink on the right was what I picked which was the afternoon delight. 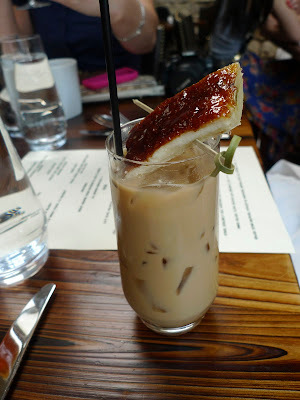 This drink had fernet, raspberry, basil fennel syrup and prosecco in it. Fernet, which I was introduced to by Jung, is a licorice tasting digestif. 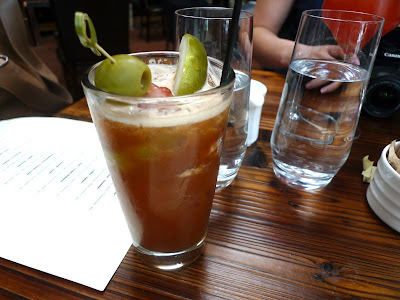 Along with the basil and fennel the drink had a very herbal taste to it, which I thought was great. Becky ordered the "curious jorge," which consisted of tequila, bruleed banana, ice coffee and horchata. It was delicious as it sounded but man it packed quite a punch. It was pretty strong, a definite pick me up. 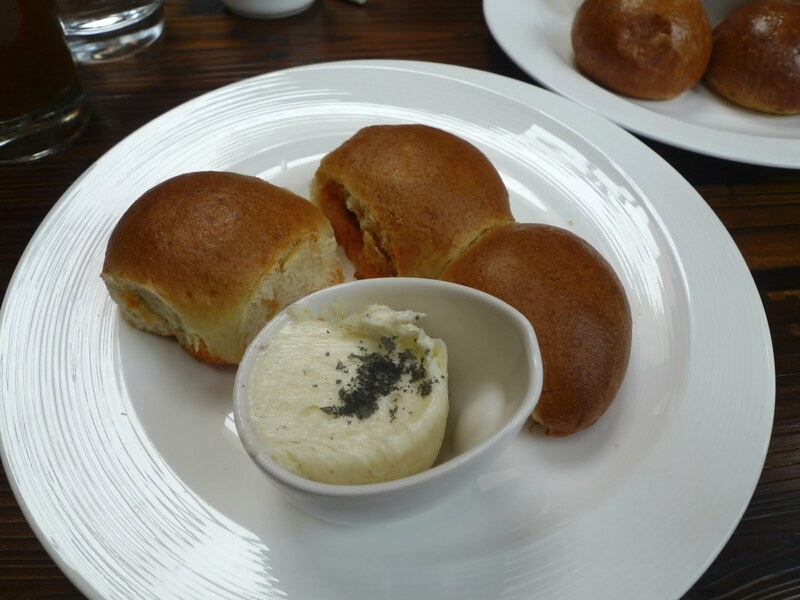 To eat, we started off with some lithuanian bacon buns, which they brought out with butter and black rock salt. This reminded me of cha siu boa, chinese pork buns. 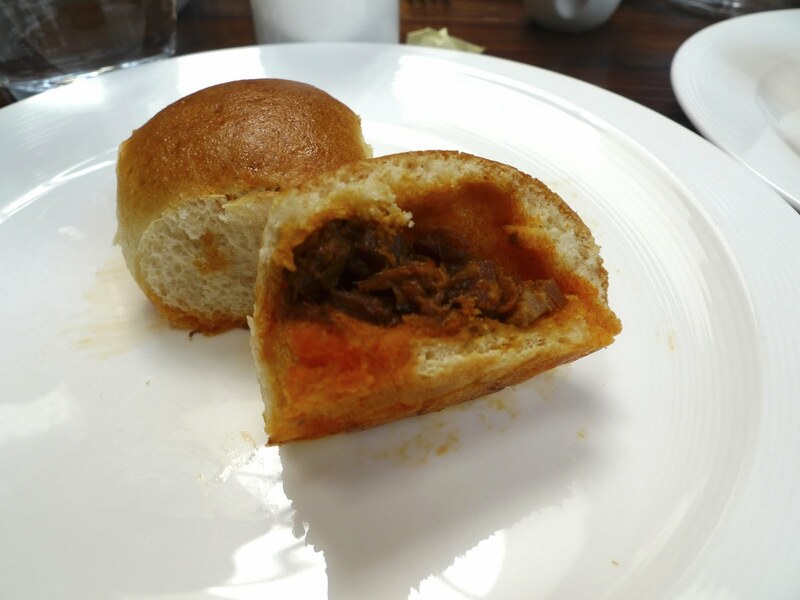 I wasn't too crazy about these buns. It sounded better than it tasted. Maybe if they heated them before serving it might have been better. But I'd pass on these next time. 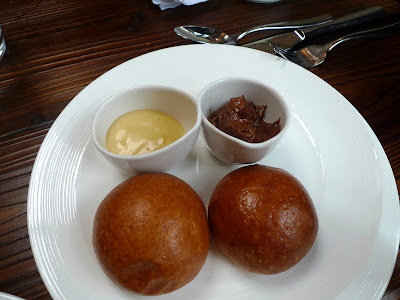 They also recommended the brioche with lemon curd and chocolate. Again, not the biggest fan. The lemon curd and chocolate were great, but the brioche was forgettable. 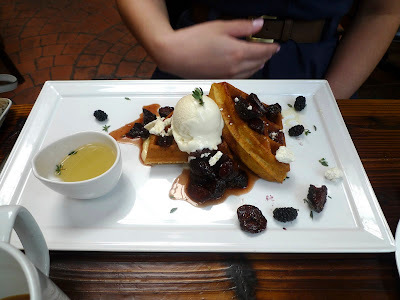 Mary ordered the lemon poppyseed "waffle" with goat cheese gelato, blueberries and figs. It was served with simple syrup with lemon tea and thyme. Mary was a little miffed that they only gave her half a waffle. lol. 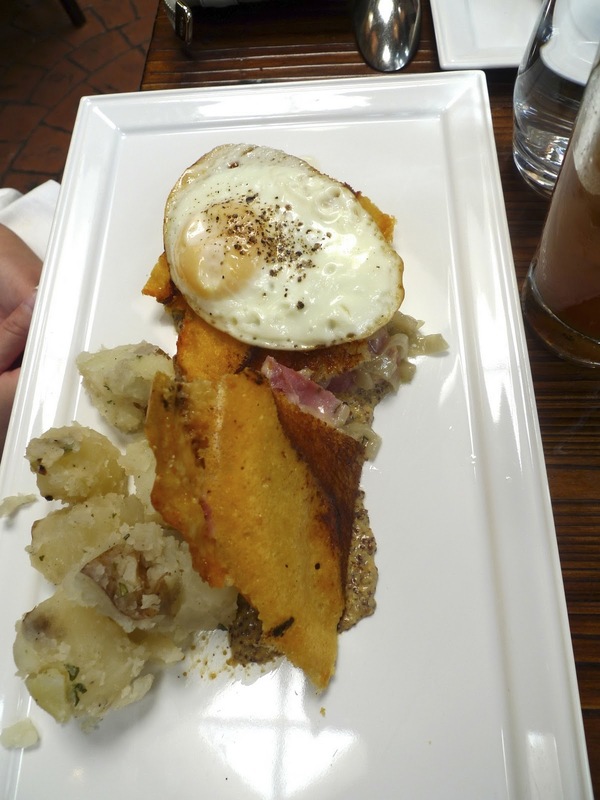 Jeanie ordered the ham "Croque Madame." It's hard to tell from this dish but the orange looking thing is actually the sandwich. I'm not sure how they did this but they formed a crusty cheese exterior to the sandwich reminiscent of large parmesan crisps. It sat on a cherry mustard sauce, and to the side were roasted potatoes and a fried egg on top. 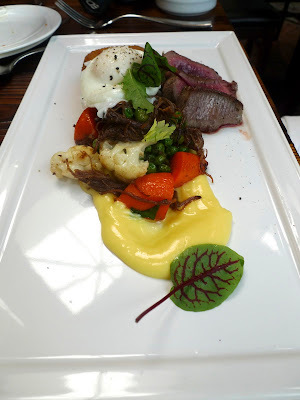 Last but not least, Becky ordered the lamb "egg benedict" with pea, carrot, leek, cauliflower and mint. This dish was so pretty to look at and was a lovely interpretation of egg benedict. Overall I thought brunch at Sprout was great. Aside from the buns, I loved their cocktails and the food was all really beautiful and tasty. I'm still a little perplexed as to why things were so slow that day. I don't even know Dale personally, but I was genuinely concerned for him and the future of Sprout, but turns out my concern was unwarranted because he's opening up a second restaurant in the spring of 2012 called frog n snail in Lakeview. I suppose the name of his restaurant was a perfect metaphor for his restaurant ventures to come.